The resilience of critical installations – the ability to remain operational even when there has been a power outage, hardware failure or other unforeseen disruption – is high on everyone’s agenda. With a spotlight on the direct costs and consequential losses associated with downtime, today’s electrical infrastructures require a robust continuity strategy. The demands placed on today’s hard-working electrical infrastructures are unprecedented – and in critical applications, interruptions to the provision of facilities can be catastrophic. It is now possible to design-in availability, in part as a result of developments in switching technology that now deliver solutions geared specifically for the unique demands of high availability architectures – providing a double-security assurance of performance. Static Transfer Systems (STS) are intelligent units that transfer the load to an alternative source when the primary source is out of tolerance, guaranteeing the redundancy of the power supply to critical installations by means of two independent sources. Furthermore, the latest solutions can improve system efficiency whilst minimising design budgets – making the most of limited space available whilst optimising performance, introducing flexibility and maintaining business continuity. The STATYS XS enhance power availability whilst simplifying the electrical architecture. Supplied by two independent sources, STATYS XS provides redundant power to mission and safety critical loads, increasing the power supply availability by selecting the best quality power supply. 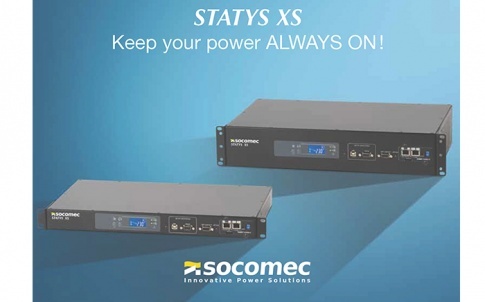 Furthermore the new STATYS XS is a competitive alternative to redundant power supply (dual corded) in the equipment cabinet in terms of price and features. Easy rack integration, real time monitoring (RS485) and easy and quick connection of the loads via multiple IEC 320 outlets makes the STATYS XS the solution for rack servers, IT networking and Hubs and Routers. Operationally secure, and easy to use, remote data can be accessed in real time and from any location. With mean-time between failure at more than 1,199,735 hours, Socomec is widely established as the STS specialist, with over 30 years of experience in the field. Providing protection against main power source outages and failures in the upstream power distribution system, Socomec’s static transfer switches also protect against failures caused by faulty equipment supplied by the same source as well as against operator error. Each STS is rated according to the load it protects, and a preferred source can be set on each unit. The STS detects any power quality disturbance, and manages source failure by providing a clean transfer for the critical load without disrupting supply to the load.